Test strategies out before putting real money on the line. Since trading for a living requires a systematic approach, everything has to be tested out before it comes into play. I like to put everything into simpler terms, so let’s dumb this concept down a bit. Let’s say that McDonald’s wants to roll out a new product. The company doesn’t just start selling the McRib and hope for the best! It finds the target demographic, pros and cons in that market segment, tests it out with a certain consumer base, and then slowly rolls it out. By that logic, there’s no way a new trader (or experienced in a new market) should just jump into things without dipping a toe in the water first. That being said, you have to paper trade strategies before actually diving in. There’s no way you can fail if you have tested the strategy out and you know, with absolute certainty, that it is successful. Predict larger moves in price and use smaller sizes. This aspect of trading is actually what leads to experienced traders blowing up their accounts. The problem with trading is that if you’re making money, it can actually hurt you. Aside from getting overconfident, you think that you can predict smaller moves and just use a larger size. Although this might be right, it does have a huge downside. With great size, comes even greater responsibility. You have to be able to deal with a huge unrealized loss if you keep your stop-loss too loose. 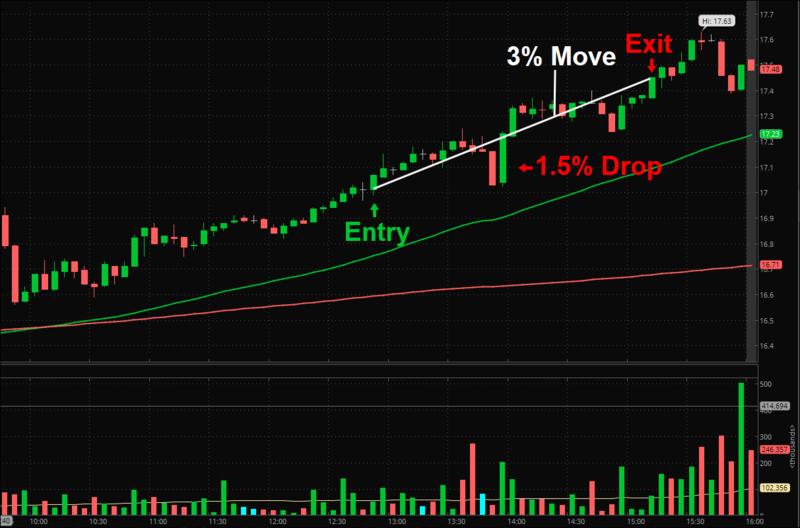 Below is an example of a day trade on THC for a 3% gain. If I had used too much size in the trade, I could have been stopped out on the 1.5% drop. But by using my typical size and not getting overconfident, I was able to take advantage of the full move and stay in the trade. Using a larger size results in more emotion and less reliance on the chart. This can also result in questioning of your strategy, even if it works. Either way, size puts pressure on a trader. You can avoid this by trying to predict larger moves and using a smaller size and/or larger timeframe. 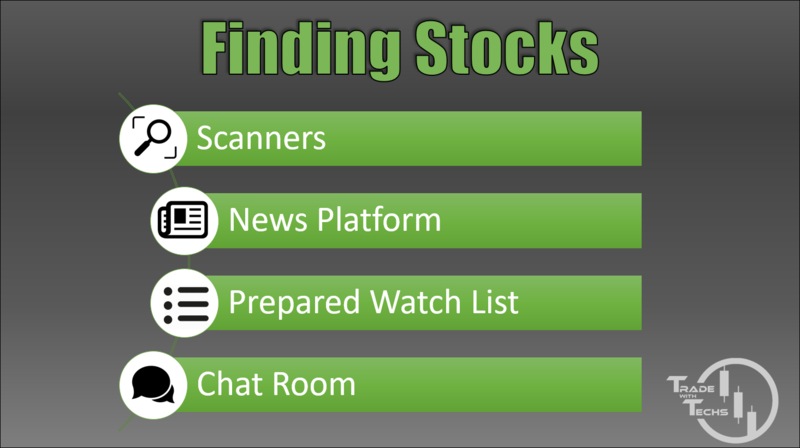 Find the right stocks to trade and play what's in play. I will go more in-depth into finding stocks in another blog post. Feel free to reach out and learn about our trading chat room or how to find stocks in play. I could write about a book about finding your niche, but I’ll keep it simple. Your niche is not something that is fun, it's what you're good at. Just because something is fun to trade doesn’t mean it’s the right thing to trade. Let’s put this in terms of basketball. Just because it’s “fun” to dunk the basketball, doesn’t mean it’s the smartest thing to do. If Steph Curry can shoot three pointers well, then why would he try to dunk the ball every time? Instead, he found what he was good at, and worked on it. Finding your niche is the same. Find what you’re good at trading, and DOMINATE it! This last point isn’t the most important, but it’s what I what you to remember from this blog post. Even after you’ve found the right stocks, your niche, your winning strategy, etc., you can still blow up your account. With tons of stocks coming into play daily, it can be very exciting! Try to sit on your hands as much as possible. If you start missing opportunities, then analyze the movers and write down why you think you should have played. If you see a pattern, then alter you strategy a bit. Bottom line, don’t just jump the gun and trade everything. It’s better to miss out on an opportunity than to blow up your account.